Forum Index > Historical Arms Talk > armour of medieval hungary. russian, western or both? Posted: Sat 19 Nov, 2016 9:43 pm Post subject: armour of medieval hungary. russian, western or both? if i, or a friend of mine were to make a slight kit for being a medieval hungarian, what would be features that would stand out from being, say, italian, german, french etc. same question goes for adoption of more russian/ byzantine armour in hungarian forces. The Kingdom of Hungary was the last bastion of Catholic Europe in the east, and highly influenced by the Germanic cultures to the west. Almost all evidence for how soldiers were equipped and fought in battle throughout the high middle ages suggests a strong western character. It's important to keep in mind that for much of the time between the 12th-14th centuries Cuman nomads who were settled in the steppe-like plains east of Pest were also incorporated into the regular Hungarian armies. Based on many surviving frescos the Cuman light cavalry typically wore the clothing of western peasantry by the 14th century, but continued to fight with composite bows from horseback as their traditional lifestyle dictated. An interesting blend! Here are a couple of threads on other forums related to gaming content that have a lot of medieval Hungarian artwork and artifacts on display, but which you need to read through carefully to sift out the details! However, as the Ottomans made inroads through the Balkans from the fifteenth century onward and came into direct contact with Hungarian armies, things began to change! The armament and tactics of the supremely successful Turkish armies influenced almost all of their enemies. 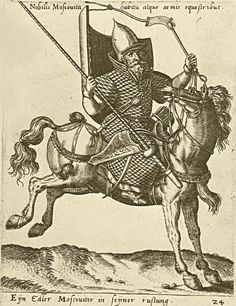 The development of elite light cavalry units in the Austrian, Hungarian, Croatian and Polish armies (known in most of those places as hussars) during the 15th-16th centuries was probably a direct consequence of the successes of Turkish sipahi units and their well-trained Tatar allies. Russ Mitchell has told me that I'm dead wrong about that - at least regarding the Hungarians - so the theory is tentative until he presents me with his rebuttal! In any case, it definitely became fashionable among Christian troops to use Turkish style armament such as sabers, chichak helmets and even things like embroidered bow cases, crescent axes and tall feathered plumes. 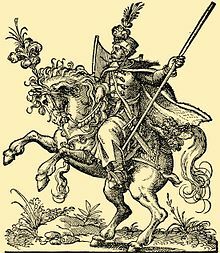 There are some clear distinctions in how the hussars of the west were dressed compared to their counterparts - the Hungarians, Croats and Poles favored wearing headgear that resembled modern top hats in many cases when they went without armour, which of course had nothing to do with Turkish fashion. Please note, however, that Hungarian infantry and heavy cavalry apparently continued to used western equipment throughout the era of the Ottoman wars! I am only discussing light cavalry fashion as a notable exception. The Rus were even more influenced by the east and also from an earlier period, with a majority of the arms and armour used from the time of the Golden Horde until the Muscovite armies were re-organized by Ivan IV were primarily influenced by their eastern overlords and enemies. The Rus themselves had little ability to actually develop their own culture during the period of Mongol influence, and as early as the mid-13th centuries Rus princes loyal to the Golden Horde were re-equipping their entire armies in steppe fashion to impress the Mongol leadership. Throughout the sixteenth and seventeenth centuries the Russian nobility favored using Ottoman-style armament above all others. Here's a series of similar period illustrations that show how far the influences of the Turks reached by the 16th century.